Northern Illinois’ landscape has been carved by glaciers and by the various drainage rivers the glacier left behind. Chicago’s landscape was also created by the different water levels of the earlier versions of Lake Michigan and their resulting beachlines. Over the last 12,000 years the water level of Lake Michigan has dropped three times and each level, or “stage”, left beaches around the outskirts of todays’ city. 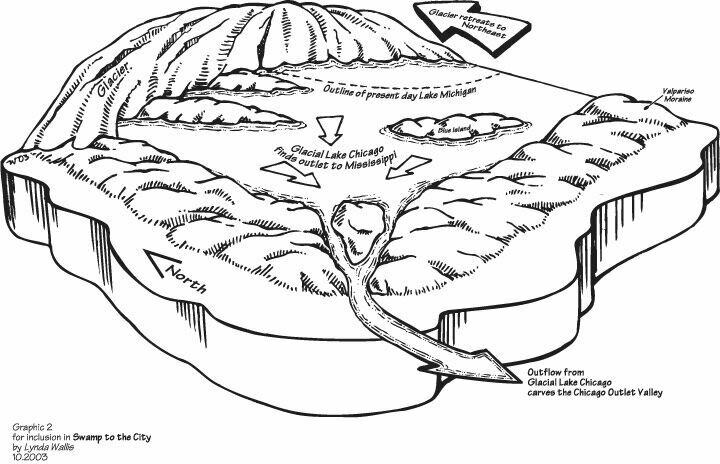 As the glacier melted back to the north, the Valparaiso Moraine acted as a dike holding back the lake that formed between the glacier and the moraine. Known as Glacial Lake Chicago, it rose until the water began to run over the lowest spots on the rim of the terminal moraine. The rising lake poured over the loose till of the moraine and quickly cut down through it. Two channels formed. The north channel, known as the Des Plaines Outlet, cut through the moraine south of the Chicago Portage National Historic Site. The Stevenson Expressway (I55), the I&M Canal, the Des Plaines River and the Chicago Sanitary and Ship Canal, all pass through the moraine in this channel. The south channel, known as the Sag Outlet, cut today’s Cal-Sag valley. The two channels met just west of the western end of Mount Forest Island (at Rt. 83 and Archer Ave.). 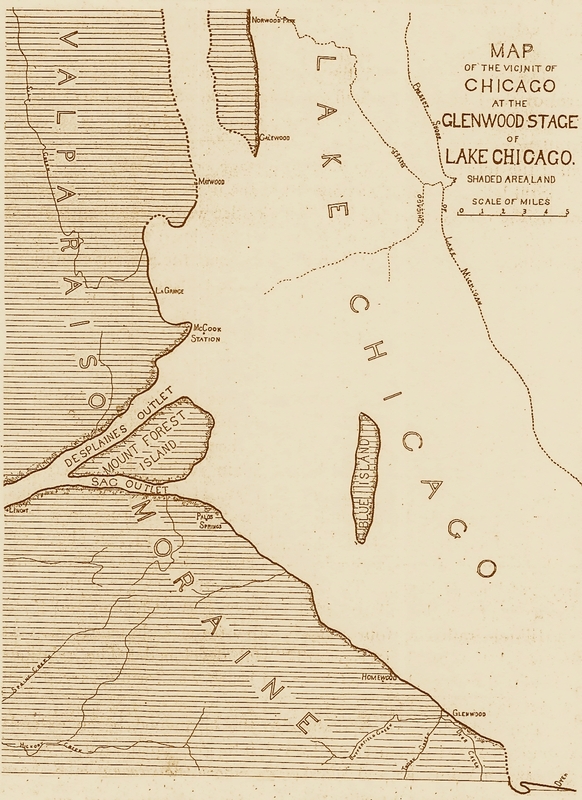 The combined channels formed the Chicago Outlet River which ran southwest to carve out the Chicago Outlet Valley. At height of its flow, it drained Lake Michigan, Lake Huron and Lake Erie and was one of the largest rivers on earth. As the glacier melted back to the north, its meltwaters found another drain through the lower great lakes and the St. Lawrence River to the Atlantic Ocean. Lake Michigan’s water level dropped and the Chicago Outlet River dried up leaving behind two gaps in the moraine and what is now known as the lower Des Plaines Valley.